Following initial shipments of the iMac Pro that have started to be delivered to customers over the past few days, the iMac Pro is now available for pickup at many Apple retail stores in Australia and Japan. Apple's website lists the iMac Pro as available for pickup today at around half of its retail locations in Australia and Japan, but for now it appears that only the base model has immediate availability, allowing customers to place orders online from store stock. 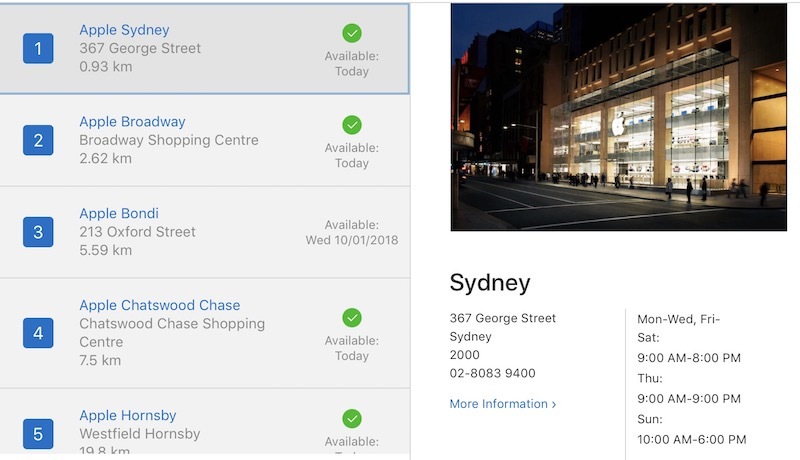 While we're currently seeing pickup available only in Australia and Japan, it's possible other countries with personal pickup could see similar availability once the clock rolls around to Friday in those countries. Since the workstation is highly customizable, many customers may still prefer to order from Apple's online store, where exact tech specs, accessories, and software add-ons like Final Cut Pro X can be selected as desired. iMac Pro starts at $4,999 for a base 8-core model in the United States, with 10-core models available from $5,799, and these configurations are currently estimated for delivery by early to mid January from Apple's U.S. online store. 14-core and 18-core models start at $6,599 and $7,399, but they don't ship for 5-7 weeks. Online, every configuration has optional upgrades available for storage, memory, and graphics, with prices topping out at $13,199 for a maxed-out, high-end model with an 18-core Intel Xeon processor, 4TB of SSD storage, 128GB of ECC RAM, and AMD Radeon Pro Vega 64 graphics with 16GB of HBM2 memory. Update December 29: Apple is now showing personal pickup availability for the base iMac Pro model at many stores in the United States and Canada. Wow...guess you all can afford the new iMacPro and upgrade options...NOT! Actually, I do need one and I can afford one. As a matter of fact, I cannot afford to not get one. It will shave hours off my work week, freeing me up to focus on the many other tasks associated with what I do. Those of us that need an iMac Pro know who we are. But I can't understand why you (and others) that don't need one display so much angst against it. Yes, it may well do so, but it's unlikely to identify you as someone who "needs" an iMac Pro, since virtually no work has been performed on one yet, and the resulting work performed on one in the future is unlikely to be distinctly different from work produced on any other computer. Larry, you obviously do not have a need for a computer this powerful (and the resulting cost) and that is totally 100% cool, but there are people that do need a computer this powerful and are more than willing to pay for the benefits it brings. I'm just one example of a wide-array of people that need powerful computers, but allow me to explain why I "need" a computer like the iMac Pro or possibly the upcoming Mac Pro that may be released sometime in the next year or so. I am a full-time photographer and video producer. The work I do is my main source of income. What I produce is literally what puts the roof over my head and the food in my mouth. Compared to my late-2014 iMac (in my sig below), the iMac Pro will shave a TON of time off my editing work. On the days that I spend in my editing studio, the iMac Pro will easily shave an hour and a half or more off my day. That is time that is freed up so I can complete additional work that I am being paid for. Furthermore, it's not just the increase in speed that comes from specific one-time tasks such as a large transcode, it is also the ability to smoothly flow through cutting and editing 8K video and multi-cam 4K. The advantage to this cannot be stated enough. When I am able to flow smoothly through the editing process without hiccups, dropped frames, or interruptions, then my creativity can better emerge and I am even more likely to produce a better product. Remember, the desire for someone to hire me for their next project hinges on just how good my work is. Hopefully this gives you some insight as to how and why some people need a computer as powerful as an iMac Pro and why we are willing to pay so much for it. It's all about utilizing the right tool for the right job. Great, now I can drag my $10,000 AU iMac Pro onto a train. The number of people, even on this forum of above average users, that need an iMac Pro, is tiny. And those that need it can generally afford it. But I can't understand why you (and others) that don't need one display so much angst against it. I can't speak for all, of course, but I bet one of the major reasons for that is that they love Apple - MacOS, more specifically - but the offerings don't fit what they need. Then something like this comes along, which is nice but too costly. Thus, you're sort of left hanging. I can fully understand why angst shows up. So cheap! I think I'll get 3 of them. No thanks. The work I produce speaks for who I am. * the models with more cores than 10 are not available on the site so cant price those. If you can afford an iMac Pro you can afford a taxi or Uber home with your new expensive box of iMac. Infact before they closed George St to traffic I have seen Apple store employees standing outside the store hailing a cab, for someone who is just bought an iMac or screen, while they wait inside the store. I'm sorry for the Apple Bondi store. Not getting any until next October while everyone has them available now. Europe and, presumably, the British Commonwealth nations like Australia list their numerical dates DAY/MONTH/YEAR, unlike the USA which is MONTH/DAY/YEAR. So the Bondi store will be getting iMac Pros the Wednesday after next, not in October. Since I started using computers decades ago, I have preferred the Japanese method, which is YEAR-MONTH-DAY, which results in correcly-ordered listings when you sort anything using that system.